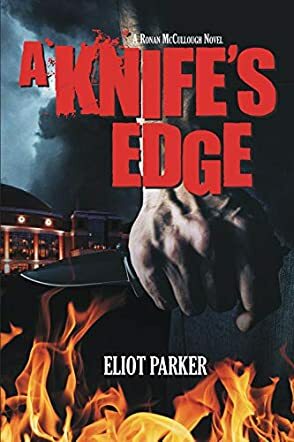 A Knife’s Edge is an action-packed work of thriller fiction by author Eliot Parker. Following the exploits of Charleston police sergeant Ronan McCullough from previous books, this particular crime drama finds our hero deep in the midst of a drug war in the city he has sworn to protect. As Ronan fights the good fight, the body of Sarah Gilmore is discovered in a burning car, a woman he knows. Ronan can’t help but think that her death is way more than a simple killing, and he is determined to uncover a much larger conspiracy from this single murder. What he finds is even bigger and deadlier than he would ever have imagined. Eliot Parker has created a fast-paced crime drama that absolutely flew by, with plenty of plot twists, action sequences and fascinating tidbits of intrigue thrown in to keep you interested from page to page. Parker writes in a no-nonsense style that makes his work engaging and speedy, only pausing for necessary moments of revelation when you really needed it. Ronan McCullough is a gritty detective that honors the crime genre but also goes beyond it in showing a great deal of realism and empathy, and the characters that populate his world are well drawn to reflect this. Overall, A Knife’s Edge is an excellent crime story with a credible and exciting plot, and a central character whose heroism is subtle but moving the more time you spend with him. A highly recommended read.